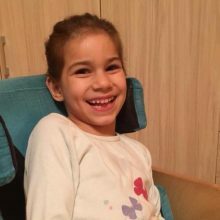 Anna Krusteva is 7 years old and is from Tagovishte, Bulgaria. She has been using an eye-tracking system to communicate, to study, to play games for almost 2 years. Anna is extremely intelligent and persistently uses every free moment to study. Annie already knows the alphabet, she is learning to read and write, and next year she will be a pupil in first grade. The eye-tracking technology she is using allows her to communicate via a symbol-based communication system, to write words, but also to listen to her favourite songs, stories and films, as well as to use Skype, the website ucha.se and to play games (and to sometimes change the channels when her grandfather is watching football matches). Annie is very proud of her independence, loves meeting with her friends as well as with new people. You can see also see her in Leda Tvetkova’s film “Talk to me” for the tv show ‘120 minutes’ and bTV reporters in the video below.